Since 1997 I have travelled each year to India, to learn from spiritual people, teachers, warriors, Jathedars, Sants, Yogis, Pirs, Monks, intellectuals but I met hardly anyone like Akali Baba Tara Singh Nihang ji. By the time I met Baba ji I was quite dismayed as I felt I needed a teacher to teach me about spirituality of the Guru Granth Sahib. All the people I had met so far were great but they just didn't do it for me. One Baba ji could meditate from long periods even up to a year, but he had no concerns for the world at all, another wanted lots of money if I wanted to learn, another just cared about his sword and its use and didn't read much gurbani, meditate or did any seva, another didn't speak and just read gurbani all day, I hadn’t found anyone with balance but I have the utmost respect for what all of them showed me. At this stage I was naturally quite cynical, and even quite reserved about the Nihang Singhs, many of whom knew more about horses and guns than spiritual matters. This thought was getting me quite down so I spoke to Bhai Uday Singh of Buddha Dal at the Bagicha of the Shahids and Baba Bamba Singh ji. I had tears in my eyes so didn't look at him directly. I asked him if there was any Singh he knew who was all round, mystical and knew the traditions. He didn't even blink, he said 'over there' and pointed to a room. I thought he was mocking me, I asked again, he pointed in the same direction. He said 'I will introduce you to a Brahmgiani who did Sangat of Akali Baba Sahib Singh Kaladhari.' I knew he wasn't joking. I followed him to the room, he knocked once on the door gently, which was more courteous than I had seen Uday Singh ji. After what seemed like ages a frail looking Akali Nihang Singh Baba opened the door, and loudly with lots of spirit said the Khalsa Gurfateh! Baba ji was very frail but great for his age, which according to him was between 110-113 years old. When you were near him you would feel a cool breeze, this feeling of peace would enter you, and make you shiver with anand! The many people I took to meet him, would just start crying with bairag, it was such a magical presence that he had, such innocence but wisdom. He always wore blue bana, and kamarkasa, he slept by his sword, with his durmalla and kamarkasa, always ready to get up. He wore a chakkar and small khanda, and said to me 'what is the point of reading the dumalla salok, if you don't put a chakkar on or torah?' He washed his clothes himself everyday early in the morning. He always looked clean and tidy! He had no material possessions except for gutkas, bane and shastar. He would clean his teeth with a twig each day, and laughed at the idea of a toothbrush. He said to me 'how can you put that back in your mouth the next day, after its become joota, and covered in saliva'. He still had a full set of teeth at his ripe age! Baba ji’s eyes were amazing, physically they were brown, but they always appeared to be very blue, like another hue or light was in his eyes! Baba ji told me that Sikhi would spread to the West, and many people would take up the gift of bani and bana. He told me not to take the gurbana off, and read gurbani. He also told me not to do nindia of Jhatka just because people do not like it. He taught me a lot about the Sri Sarabloh Granth and what Akali Baba Sahib Singh Kaladhari had taught him about it. One day I aksed Baba ji to teach me Santhia, as this is and was a tradition of the Buddha Dal that senior members would teach beginners like me. I felt a bit scared to ask him as his presence was very powerful. One day I got the courage and asked him ‘Baba ji please could you teach me santhia’. He said ‘son how long are you here for’. I replied ‘no more than a year’ he said ‘ok perhaps you should just learn up to Sri Rag, than you will be able to grasp the rest of the Gurbani’. Then he thought and said ‘no that will take too much time, perhaps just learn nitnem properly’, then he thought and said ‘no just learn the meaning of japji sahib’. Then he paused and said ‘ no just learn the meaning of mool manter……….the meaning of the maha manter………no…the meaning of Ik Oankar Satinam….no…the meaning of Ik Oankar…..no …… just IK….son if you understand IK you will understand all of Guru Granth Sahib ji!’. It blew my mind! I felt like I was going to faint, his words just echoed inside me…..it was intense and liberating! When Baba ji was in his twenties the British banned the three foot Kirpan in the Punjab, Baba was going from his parents home to perform a duty reading Path in Bana. He went past a train station and an Official had him stopped, his guards said to the young Baba Tara Singh in a rude manner take of your Sword. Baba ji explained that the Sword was his Sri Sahib, and not to disrespect it, and he was going to go and do Path and he was getting late. A British police officer was instigating the Indian officers to apprehend Baba ji. Baba ji wasn’t stupid, so he went up to the British official to explain to him. The official also knowing the dislike of the Akalis Nihang Singhs of tobacco blew smoke in Baba ji’s face. He pointed his revolver at Baba ji, and cocked the pistol. He fired a single shot at Baba ji that hit Baba ji in the stomach, Baba ji pulled out his sword and in one blow decapitated the Officer. Everyone looked on. The Indian officers swore at Baba ji saying you will get us all hung! A crowd tried to apprehend him, but he swung his kirpan very fast, and seeing the dead officer, many others ran. Baba ji started to do Jaikare, and some other Singhs came to his aid, and in this way he got away. He got to Akali Baba Sahib Singh Kaladhari who ordered him to stay in the Dal Panth for life. A hakim was called for, who removed the bullet, and Baba ji recovered. The biggest virtue Baba ji spoke of was loyalty. He always quoted the story of Ramayan, from the Hanuman Natak and Sri Dasam Granth Sahib about Hanuman and Ram. He said without this virtue there are no others. 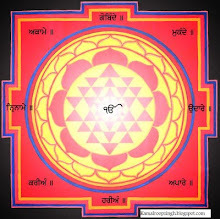 He was born at amritvela on the full moon, in November. The same time Guru Nanak was born. 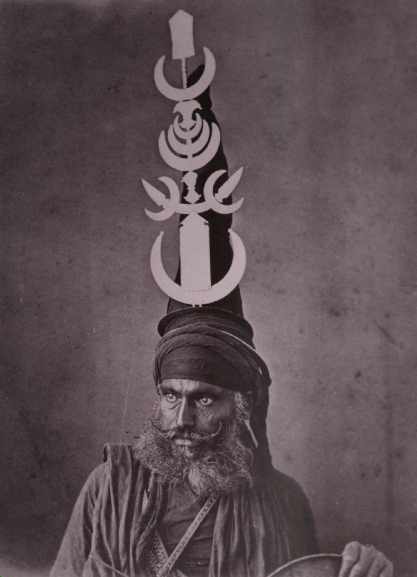 His farla or plume was awarded to him by Akali Baba Sahib Singh Kaladhari. He was the student of Baba Sahib Singh, the last Akali Nihang Jathedar of the Khalsa Panth. There literally is hardly a day that goes by without treasuring his naam-filled memory! I get tears in my eyes thinking about him. The time I spent with him was magical, full of peace and love, and trust. I have no doubt that Baba ji went to Sachkhand, not after death but lived in that state in his very life! Akali Baba Tara Singh on the far left.